K.V.Anand's current film, starring Vijay Sethupathi, T.Rajendar, and Madonna Sebastian is temporarily referred to as 'AGS 18', as this is the 18th project of AGS Entertainment. 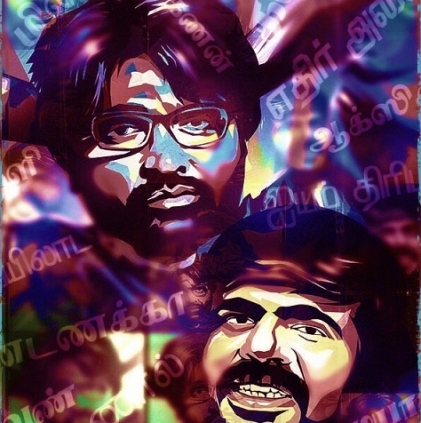 The title of the film hasn't been revealed till date, but the director had put up a photo puzzle yesterday (17th October) on Twitter, which had many Tamil words and images of Vijay Sethupathi and T. Rajendar in it. The words listed out in the poster are, Thiribu, Dandanakka, Yaaganan, Meelaavattam, Aakshi, Mayilada, Naal, Migai, Aiyam. Many other words are present in the photo puzzle, but only one-half of the word is revealed. All these above-mentioned words are related to a television setup and going by the core plot of the movie, which is said to be about television reality shows, we guess that the film might be called as 'Mei Nigari'. It should be noted that Kabilan Vairamuthu is one of the writers in this film, who has written the novel 'Mei Nigari', which was chosen as a course material for the National University of Singapore. While talking about the Mei Nigari novel, he had once said, "Mei Nigar means virtual. My novel is happening in a TV channel and I call the TV channel as Mei Nigari, a place which produces virtual elements. It is basically about a reality show being produced in a TV channel. It is about the experiences of the producers, technicians, how the show is commissioned and the marketing aspects around it. One under theme of the novel is lifotainment- a mix of life and entertainment. Any media product which is reflective of life’s fine nuances should be termed as lifotainment." So, is Mei Nigari, the title of AGS 18? Let us have to wait for the official announcement regarding this. People looking for online information on KV Anand, Madonna Sebastian, T Rajendar, Vijay Sethupathi will find this news story useful.